Earlier on this month, we saw Jei Tseng of J.T studio’s open up the worldwide pre-order for OG colour of his Monkey King 8″ vinyl which you can check out HERE. Thailand Toy Expo is just days away now and Jei reveals his 2nd release for TTE 2018. Monkey King joins the new line of vinyl figures from Jei, modern twists with J.T Studio flare with folklore and traditions all tied into the design. Accessories all included as well as the flexible tail on Monkey King! Now in a classic GOLD n Black edition. 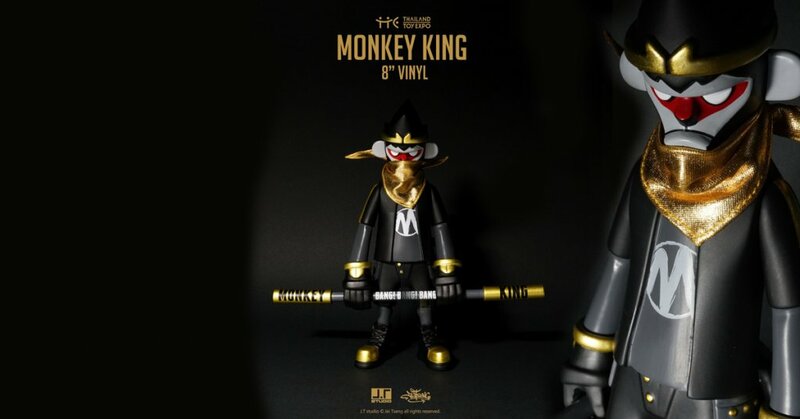 TTE EXCLUSIVE – Monkey King 8″ Golden ver. Did you miss the JIANS GOLDEN 2PACK? You can get your daily Designer Toy fix from our TTC Mobile App. It’s free too! FREEEEE! Download on the iPhone or Android smartphones. Search for “The Toy Chronicle” and all your Designer Toy wishes will come true! Pretty much.